Rueegg CS, Barben J, Hafen GM et al (2016) Newborn screening for cystic fibrosis – The parent perspective. Journal of Cystic Fibrosis. 15, 4, 443-451. 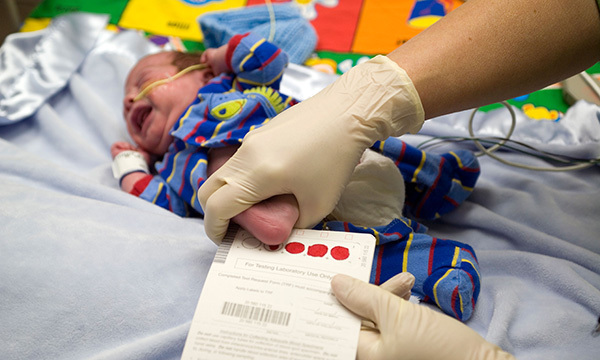 Newborn screening (NBS) identifies pre-symptomatic babies that are either at risk of carrying or are affected by genetic or congenital conditions (UK Newborn Screening Programme Centre 2012). Screening for cystic fibrosis (CF) is not diagnostic and further testing is required once a positive screening result has been obtained to determine whether the child is affected by CF. NBS programmes for CF have not been introduced universally worldwide, with some countries still not having a NBS programme for CF and others having sporadic rather than national programmes. For instance, universal newborn screening for CF has been available throughout the UK since October 2007 but only became available in Switzerland in January 2011. The benefits of newborn screening for cystic fibrosis have been widely acknowledged and include improvements in growth, cognitive development and lung function while exacerbations and hospitalisations can be decreased (Balfour-Lynn 2008, Brice et al 2007, Castellani 2003). A possible drawback of NBS is the anxiety and distress that parents of children with positive screening results may experience. This research, undertaken in Switzerland, had many aims including exploring the information given to parents about NBS at birth and satisfaction with the information received during the CF NBS process. All parents receiving a positive newborn screening result for cystic fibrosis were informed of the result and invited to attend a CF centre. Parents were then given a questionnaire to complete at home which collected information about the NBS process and parental satisfaction with information provided. Two hundred and sixty children with a positive screening result were referred to a CF centre. Of the 138 parents who returned the questionnaire, 13 (11%) remembered receiving a brochure before birth, 76 (58%) remembered receiving it after birth. Sixty-nine (85%) thought it was good. Most parents (n=98/78%) were troubled or anxious after the CF centre informed them that their child had a positive screening result, but only 51 (38%) were still anxious after visiting the CF centre. Most parents (122 of 138/88%) were glad their child had been screened. The main finding of this study was that well-informed parents are less stressed by the screening process. It is acknowledged that parents find the delivery of positive newborn screening results distressing and this appears to be largely influenced by information provision at the time of screening and when the result is communicated to parents (Buchbinder and Timmermans 2012, Salm et al 2012, Chudleigh et al 2016). Differences exist about how screening is offered to parents. In the UK NBS is offered on a voluntary basis; parents are required to provide informed consent and therefore opt in to the screening programme whereas in Switzerland (and in the United States, except one state, and Canada) an opt out approach is taken. It could be argued that as parents in Switzerland are not required to provide informed consent for NBS, this could influence the information provided in the NBS process. However, this finding is not unique to this study and has also been found to be problematic in the UK where informed consent is required (Chudleigh et al 2016). Indeed, research has shown that even in the UK, parents often see NBS as a fait accompli and as such do not consider that they have a choice to decline (Nicholls and Southern 2012) which may affect their experience when presented with positive NBS results. The findings of this study continue to support the notion that better information provision at all stages of the NBS process is required to reduce parental anxiety and distress and that this is something that needs to be addressed nationally and internationally. Balfour-Lynn IM (2008) Newborn screening for cystic fibrosis: evidence for benefit. Archives of Disease in Childhood. 93, 1, 7-10. Brice P, Jarrett J, Mugford M (2007) Genetic screening for cystic fibrosis: an overview of the science and the economics. Journal of Cystic Fibrosis. 6, 4, 255-261. Buchbinder M, Timmermans S (2012) Newborn screening for metabolic disorders: parental perceptions of the initial communication of results. Clinical Pediatrics. 51, 8, 739-744. Castellani C (2003) Evidence for newborn screening for cystic fibrosis. Paediatric Respiratory Reviews. 4, 2, 278-284. Chudleigh J, Buckingham S, Dignan J et al (2012) A parents' experiences of receiving the initial positive newborn screening (NBS) result for cystic fibrosis and sickle cell disease. Journal of Genetic Counseling. 25, 6, 1215–1226. Nicholls SG, Southern KW (2014) Considering consent: a structural equation modelling analysis of factors influencing decisional quality when accepting newborn screening. Journal of Inherited Metabolic Disease. 37, 2, 197-205. Salm A, Yetter E, Tluczek A (2012) Informing parents about positive newborn screening results: Parents' recommendations Journal of Child Health Care. 16, 4, 367-381. UK Newborn Screening Programme Centre (2012) Health Professional Handbook: A Guide to Newborn Blood Spot Screening for Healthcare Professionals. UK NSPC, London.